Daring Cooks Nut Butters ~ I Can Do That! Sorry for my seemingly never ending post but I went nuts with this challenge. I made 5 savory dishes and an easy sweet one using homemade nut butters. 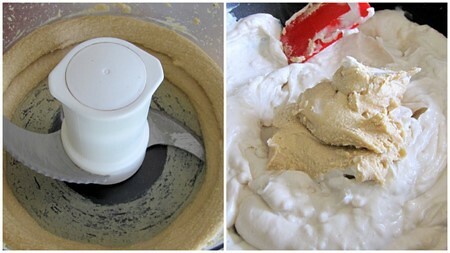 Nut butters are easy to make in a food processor, they are delicious and very healthy too. First is one of the recipes given for this challenge, a noodle salad with cashew butter sauce. I omitted just one ingredient from the sauce (ginger), adjusted the seasonings to suit my taste, and added a few drops of sriracha sauce. The salad has cold Japanese buckwheat noodles, spinach, sugar snap peas, and strips of nori for a completely vegan dish. 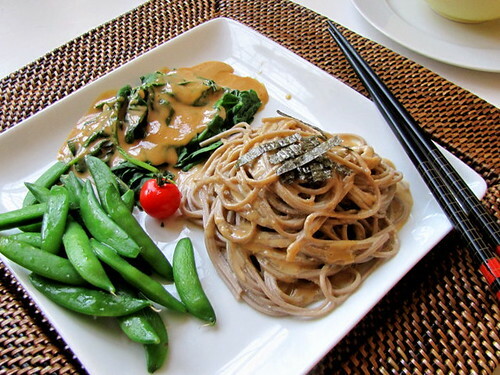 The mildly spicy cashew butter sauce is absolutely delicious with the cold noodle salad specially on a hot summer day. Make cashew butter: Grind cashews in food processor for about 2 minutes until smooth. Prepare cashew dressing: Combine garlic, cashew butter, soy sauce, sugar, vinegar, sesame oil, and water in food processor. Process until smooth and garlic is completely pureed. 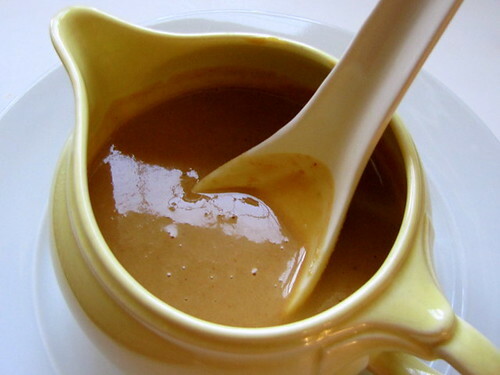 The dressing should be pourable, about the same thickness as cream. Adjust consistency to your liking by adding more water or cashew butter. Add a few drops of sriracha hot sauce if desired. Taste and add salt if needed. The second dish I prepared is Filipino tamales which I never had back when I was living in the Philippines, I don't know why. I have made a similar tamale recipe once, it was from another region in the Philippines and so I can say this is the first time I made this kind of tamale. 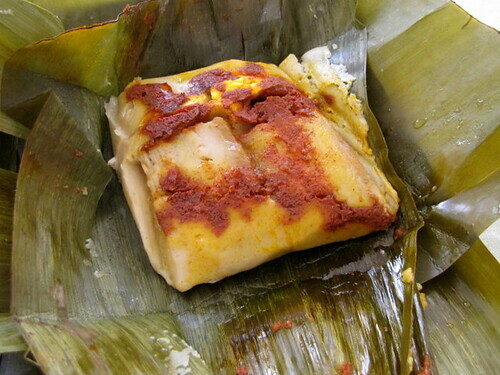 Unlike the Mexican corn tamale, this is made with rice flour, peanut butter, and lots of coconut milk. They are wrapped in wilted banana leaves and steamed for hours. I love its peanuty and soft creamy texture. 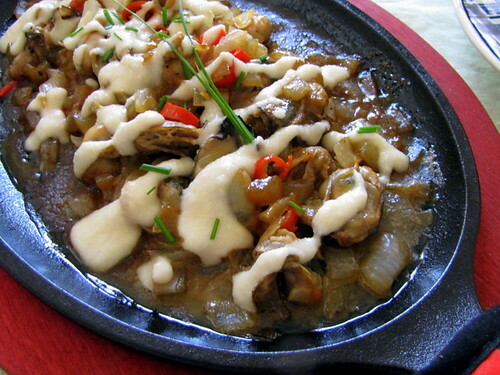 Toast the rice flour in a large non-stick wok or Dutch oven until light brown. Add the coconut milk, salt, sugar, and pepper and cook over low heat, stirring constantly. Add the peanut butter and stir cook for 10 minutes. Divide this paste mixture into two parts leaving one part in the wok. Strain the annatto, discard the seeds and add the colored water to the remaining mixture in the wok and continue cooking for 2 minutes longer. 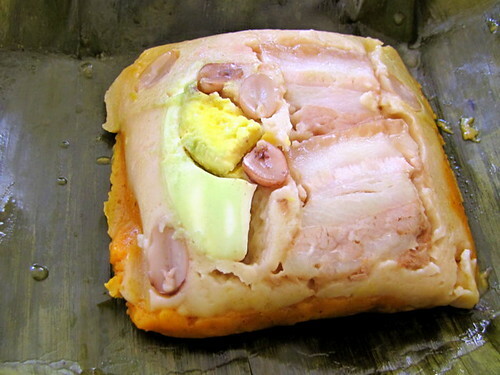 Wrap the tamales: On three layers of banana leaves, put 3 tablespoons of the red mixture, then an equal amount of the white mixture, pat lightly to flatten, then arrange slices of pork or the shredded chicken, boiled peanut halves, and hard cooked eggs on top of mixture. Wrap each tamale and tie securely. Place the tamales in a steamer and steam for 2 hours. 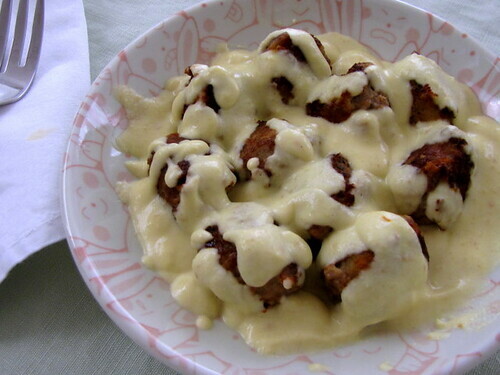 I love Spanish tapas and one of the easiest to make is Albondigas, meat balls. After frying the meat balls they are usually simmered either in almond or tomato sauce. In a bowl combine all the ingredients for the meatballs and mix until well blended, then divide and shape into small walnut sized balls. Roll in flour and fry gently in hot oil until brown all over. Set aside and keep warm. Prepare the sauce: Fry the bread and garlic in the oil until golden, then put into a food processor along with the almond butter, black pepper, saffron, clove, and white wine. 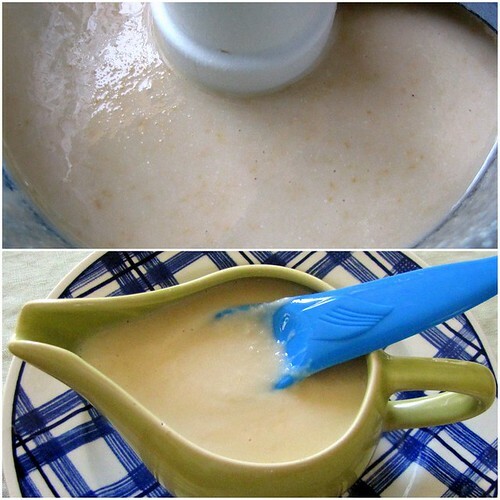 Process to a smooth paste. Pour this into the same pan and add the stock, mix well and bring to the boil. Add the meatballs to the pan and simmer for 20 minutes. Just before serving add a squeeze of lemon, a little chopped parsley and a few slivers of toasted almonds. For my fourth nut butter dish, I processed dehydrated coconut flakes to a thin almost liquid consistency. I added some vegetable broth, salt, and lemon juice and drizzled the sauce on a dish of steamed oysters and sauteed vidalia onions seasoned with soy sauce, lemon juice, and 1 sliced red finger chili. It's very yummy. 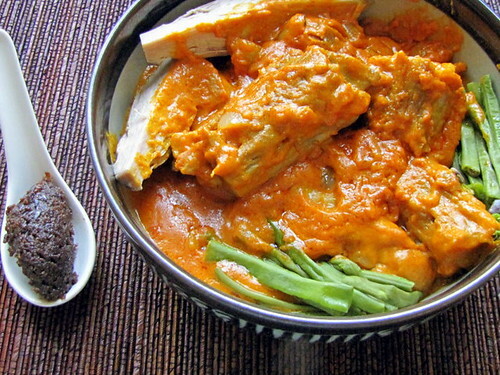 The last dish is also Filipino called Kare Kare, a meat stew colored with annatto seed oil. It has lots of peanut butter and an assortment of precooked vegetables and served with salty fermented shrimp fries called bagoong (bah-goh-ong). The usual vegetables are yardlong beans, banana blossoms, baby bokchoy, and Asian eggplant. I had some pig tails already boiled and stored in the freezer with the broth and made the peanut butter with medium dark roasted peanuts. My favorite Kare Kare is made with ox tail, recipe and photos here. And I couldn't resist making something sweet out of peanut butter and chocolate chips. I mixed equal amounts of peanut butter and chocolate chips then added powdered sugar until crumbly but holds its shape. 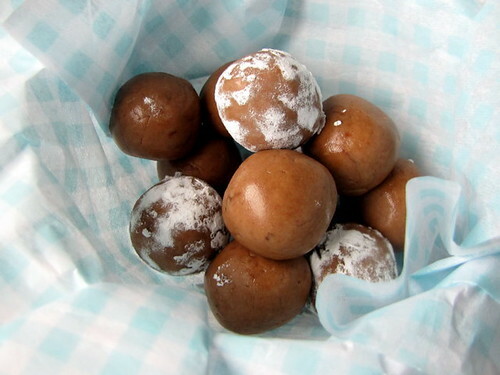 These are similar to candies in the Philippines called Choc*Nut. Great job on your challenge. I am totally speechless with the number of recipes you have come up with. Every single one looks so delicious. You went all out! From everyone's rave reviews it looks like that salad dressing was a winner. Loved the ingenious application of the nut butter in candy - great idea. Everything looks gorgeous! Fantastic job on the challenge - some really unique and inspiring recipes! Every one of your dishes look scrumptious. Thanks so much for sharing such creative ways to use nut butters. The Filipino tamales are a delightful surprise, never expected to find peanut butter in a tamale. Your almond sauce looks so creamy & delicious. I love that you had pig tails boiled & frozen ready for the Kare Kare! Thanks for sharing your Filipino specialties. Now this is a posting I have bookmarked brilliant work so many recipes and so many choices each so good and so delicious in its own way. Kudos to you and bravo bravo bravo. And yes the cashew sauce is a real winner. Cheers from Audax in Sydney Australia. WOW - I am so amazed and impressed with ALL of your dishes - they all look so good, I can't even pick a favorite. And those sweet candy balls sounds great - I just may try those as a quick dessert one day!! Truly fantastic work on the challenge. Amazing! You certainly had a lot of fun with this challenge! Thank you for introducing us to some new dishes! Your noodle salad looks amazing...! Love, love, love kare kare. I have never had filipino tamale. It looks good. Soba, great choice. I have never had choco nut. I have to try it. Looks like you had a blast with this. Well done! 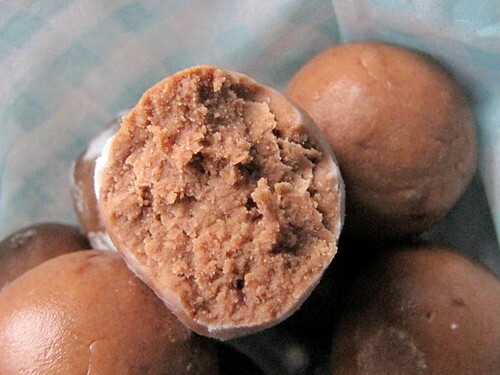 We really have to have a go at your Peanut Butter balls. These look wonderful - I have a hard time picking a favorite but I've never had Kare Kare so that will have to go on the Monkeyshines Menu one of these days. Congratulations on 'going nuts'!